Jerusalem Leaders Summit - The Official Website. 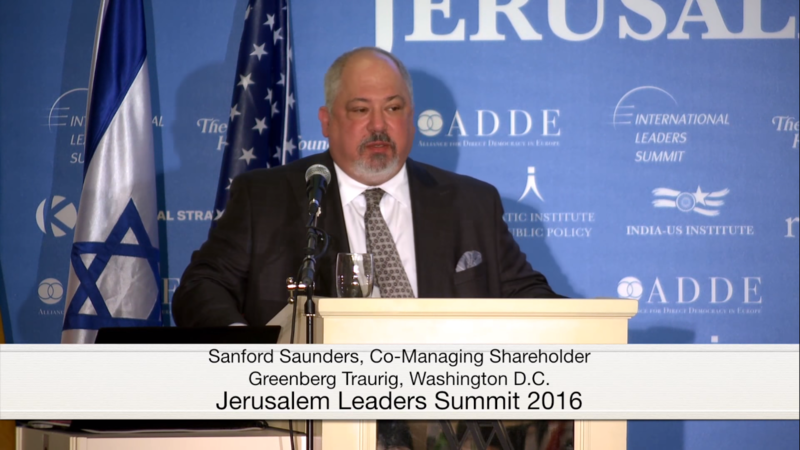 Sanford (Sandy) M. Saunders, a founding member of the Jerusalem Leaders Summit, attended the first two Summits in Israel as an international Rule of Law expert and a keynote speaker. The inaugural Summit took place in November 2015 when the Iran Deal had just been signed and when terrorist attacks escalated within Israel with stabbings in the streets of Jerusalem, leaving Israel’s citizens on high-alert surrounded by an environment of uncertainty. Safety was a concern, yet Sandy and an American and European delegation made the journey to Israel to show support and solidarity. Sandy would not have missed that journey, and was committed to participating in every additional delegation that would follow. He was a life long Jewish Republican and nothing would stand in the way of promoting Conservative values and virtues. Sandy was very proud of Natasha Srdoc and Joel Anand Samy, co-founders of the International Leaders Summit and Jerusalem Leaders Summit for what they were accomplishing, and honored to be a part of it. He referred to their actions as principled perseverance, for they never waver in their convictions and fight to the end to bring like-minded people together to tackle complex global issues. He had every intention of continuing this work with them and taking an even more active role. Unfortunately, that will not happen, but his legacy will live forever. It is the highest honor to pay tribute to my late husband, and to say how grateful I am to have this opportunity to tell a great story about this amazing man. Born on August 28, 1958 in Brooklyn, NY, Sandy attended Poly Prep, one of the finest college preparatory schools in the nation. This fine education was the cornerstone that shaped Sandy into a man of high character, integrity and morals. His parents instilled the importance of education, which drove Sandy to attend The Johns Hopkins University for his undergraduate degree and Georgetown Law School thereafter. He seized every opportunity and went for it. Through hard work, determination and unwavering character he was able to excel, while inspiring so many along the way. In personal circles Sandy will always be remembered affectionately as the Sandman. He went out of his way to make everyone feel comfortable, relaxed and welcomed. He cherished his roles of son, husband, cousin, brother, uncle, dad to his beloved pets and friend. Sandy was the go-to person for so many, and was always generous with his time and resources. He loved to help and always seemed to have a solution, or a way to make one feel like everything was going to be okay. “Sandy was the best man I ever met. He was an outstanding husband, son, brother, cousin, uncle and friend” …Gus Bondi Sr…brother (in law). Such simple words summarize Sandy to a tee, and so rightfully spoken by one of Sandy’s closest friends and brother. One of Sandy’s dearest friends, John Lunde said, “For me and for many others, Sandy was our True North. He was dependable, always available and stood for goodness, integrity, joy and character. He possessed a powerful intellect and a great sense of humor. His favorite moments were hanging out with family and friends after a holiday or special dinner. Sandy loved to grill and to enjoy a glass, or several, of adult beverage. He was truly in his element, especially when lighting up a cigar with his brain trust. And he loved the young people in his life and would do anything for them. He was always ready to lend a hand, help with an internship, give college or career advice or just simply do whatever he could to give these special people a chance. Our niece, Emily, was Uncle Sandy’s light. Emily and Uncle Sandy had a special bond and unspoken understanding. The days she stayed with us during summer internships were some of the happiest, and Sandy took great pride in helping her obtain internships and excel. And Emily loved her Uncle Sandy. She wrote, “It’s hard to describe Uncle Sandy in one sentence, but for me he was one of the most down to earth, humble and kind human beings. He was honestly one big teddy bear who I would run to when I was little for a big hug. None of that changed when I got older, but one of my favorite memories that pretty much sums up our relationship was the summer I interned in DC and we would ride into work together. Those 30-minute car rides are now what I cherish. We talked about politics, law, sports and life. When we arrived at his office I would get out of the elevator and walk the two blocks to my building, and he always left me with “See you later kiddo”. My sister in law, Kimberly, truly appreciated Sandy and constantly acknowledged how remarkable he was, and the role he played in mentoring her children. She said, “When someone asks me to describe Sandy I immediately tell them that he was the most unassuming and humble man I ever met. He was the epitome of what you strive to be…kind, considerate, and always willing to do for others. For my children Sandy was the greatest role model I could have hoped for. In his professional life, Sandy was a dragon slayer. He was an international rule of law expert who fought ferociously for his clients and for the rule of law. Morning, noon and night. He never stopped. Sandy was passionate about his work representing clients in court. He spent his last 16 years of private legal practice in the Washington, D.C. office of Greenberg Traurig, LLP where he was a Senior Shareholder in the White-Collar Defense & Special Investigations Practice group. He served as Co-Managing Shareholder of the D.C. office from 2010 -2016. His clients also included financial institutions and individuals engaged in the banking and securities industries on anti-corruption issues. Nicoleta Timofti also travelled the world with Sandy for many years, and was involved in much of the high-profile litigation that consumed their professional lives. She remembered Sandy as saying, “Sunlight is the best disinfectant.” Sandy used to say this phrase many times, and it was his credo in litigating cases that had an impact on the development and evolution of the rule of law. Sandy’s reputation in Russian and Eastern European cases brought ‘out of the darkness and into the light’ the abuses to the rule of law. Sandy took great pride in the work he did and cherished the relationships he developed along the way. For as much as he loved to return home after a long trip, he was equally as excited to leave on the next adventure. The complex legal work coupled with the colleague comradery, that came directly from his brain trust, gave him endless energy to fight for his clients. Those mentioned above and below were members of that special group until the end. Richard Levick, Chairman and CEO of LEVICK said, “Sandy was a symphony of wisdom, intellect and joy. Throughout the years, I was with him as a client, friend and brother. His steady hand and baritone laugh all the way from the center of his soul told you everything, no matter the odds, was going to be okay. In Sandy’s words, he would summarize how he approached life as “HELL YEAH!” These words were his lifetime mantra. Sandy seized life every day. He led by example by treasuring his life and sharing his wise heart. His ‘will do’ attitude seemed at times unsustainable, but nonetheless he went for it. Constantly. He was unwavering in his convictions and always dedicated to life, liberty and happiness for all. I know he is with us today in spirit, and that there is no place else he would rather be then in Israel, for the Third Jerusalem Leaders Summit. He would be humbled by the distinct honor of having an award in his name – The Sanford M Saunders Rule of Law Award – and even more humbled to have this award presented to the Israeli Minister of Justice, Ayelet Shaked. It is my honor and privilege to recognize his legacy, today and always. Sandy was my champion for 24 years, and now I am his, for the rest of my existence. Copyright © 2019 Jerusalem Leaders Summit. All Rights Reserved.